The Kimberly-Clark Corporation is one of two companies that have been awarded the prominent 2014 Catalyst Award, which annually honours innovative organizational approaches with proven, measurable results that address the recruitment, development, and advancement of all women, including diverse women. 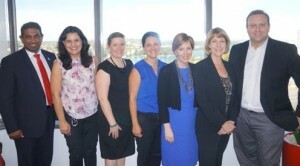 Catalyst is a global not-for-profit organization that promotes inclusive workplaces for women. According to the news release by Kimberly-Clark, the company took part in an extensive year-long application review that included extensive interviews with dozens of Kimberly-Clark employees and leaders against criteria including business rationale, senior leadership support, accountability, communication, employee engagement, innovation and measurable results. The company’s winning initiative, “Unleash Your Power: Strengthening the Business With Women Leaders“, was aimed at building a diverse and inclusive organisation that looks, thinks and behaves like the consumers who use and purchase Kimberly-Clark’s essential products in their daily lives. The initiative has delivered a 71% increase in the number of women who hold director-level or higher leadership positions globally and has significantly increased internal promotions of women to ‘director-plus’ jobs from 19% to 44% over the last four years. “Women are directly responsible for about 80 percent of purchases across our business. We must cultivate a diversity of perspectives to drive innovation and business results,” said Thomas J. Falk, Chairman and Chief Executive Officer for Kimberly-Clark Corp. The company also proudly announced that for the first time in history it had more women than men on the Kimberly-Clark Australia & New Zealand (KCANZ) Executive Leadership Team after making three new female appointments, two of which on flexible working arrangements and one assuming a newly created goal. In 2013, 66% of all new hires were also women while 48% of promotions were filled with females. With 70% of the total KCANZ employees being male, this is truly a great achievement.